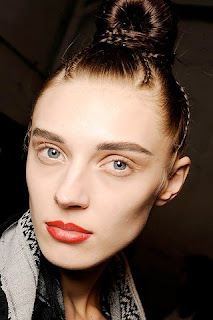 Models sported many intricate hairstyles as they walked down the runways during Fall 2009 Fashion Week. But the one that stood out the most? Braids. Whether wrapped around a bun as seen at Giorgio Armani (seen at left) or interspersed throughout the hair as at Christian Lacroix, this was definitely a hairstyle to watch. See a few more ways to sport this style after the jump. Would you wear any of these braid styles? Or do you think they're better left to the runway? Let me know in the comments!